Scanning electron microscope (SEM and Focussed Ion Beam (FIB) system resolution is defined in terms of a combination of criteria: resolution and number of gray levels in the image. This is to ensure that the resolution has not been distorted by using too much contrast to maximize visibility of the edges. High resolution images ideally show fine details together with a low noise and a good range of contrast levels. The widely used gold on carbon test specimens are excellent for SEM, FESEM and FIB resolution testing. The gold particles, with superior feature details, generate high secondary and/or backscatter electron signals with excellent contrast against the carbon background. Five different special resolution testing specimens are available with different gold particle sizes for different resolution levels. Available unmounted or conveniently mounted on most common SEMs stubs. Store your calibration and test specimens in a vacuum desiccator such as the #16179 PELCO® SEM Sample Stub Vacuum Desiccator. Each specimen has a square grid pattern with large crystals in the center of each square and very fine crystals at the edges of each grid (as illustrated). Thus, medium and high resolution gap tests are performed on the same specimen. The larger crystals show facets which allow assessment of the gray level reproduction available at high resolution. 6mm dia. x 2mm. Particularly suited for assessing the image quality of high resolution SEMs, such as those fitted with a field emission source. A magnification of at least x80,000 is required to clearly resolve the gold particles. 6mm dia. x 2mm. For ultra high resolution performance testing, this specimen has a smaller gold island particle size compared to the 617 specimen described previously. Suitable for testing field emission SEM's at instrument magnifications of x100,000 and above. 6mm dia. x 2mm. When operating at low accelerating voltages or using older instruments, difficulties may be experienced in imaging the standard gold on carbon resolution specimens. This may be due to inferior resolution at low voltage or poor signal to noise ratio when operating at high scanning rates with small spot sizes. The larger gold islands give high contrast while retaining small gaps for resolution measurement. This makes the specimen easier to use at non-optimal operating conditions. 6mm dia. x 2mm. 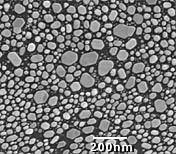 The larger gold particles, with clear separation, provide an excellent structure to setup the microscope. 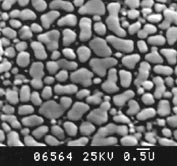 Particle size range 0.1-1µm, for scanning electron microscopes and high magnification light microscopes. Magnification range 800-10,000x.